1. Psalm 50:11-12 I know every bird on the mountains, and all the animals of the field are mine. If I were hungry, I would not tell you, for all the world is mine and everything in it. 2. Genesis 1:20-23 Then God said, “Let the waters swarm with fish and other life. Let the skies be filled with birds of every kind.” So God created great sea creatures and every living thing that scurries and swarms in the water, and every sort of bird—each producing offspring of the same kind. And God saw that it was good. Then God blessed them, saying, “Be fruitful and multiply. Let the fish fill the seas, and let the birds multiply on the earth.” And evening passed and morning came, marking the fifth day. 4. Matthew 6:25-27 “That is why I tell you not to worry about everyday life—whether you have enough food and drink, or enough clothes to wear. Isn’t life more than food, and your body more than clothing? Look at the birds. They don’t plant or harvest or store food in barns, for your heavenly Father feeds them. And aren’t you far more valuable to him than they are? Can all your worries add a single moment to your life? 5. Luke 12:24 Look at the ravens. They don’t plant or harvest or store food in barns, for God feeds them. And you are far more valuable to him than any birds! 6. 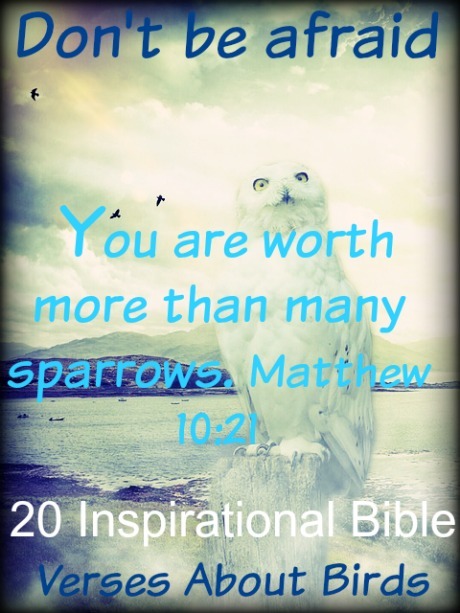 Matthew 10:31 Fear ye not therefore, ye are of more value than many sparrows. 7. Luke 12:6-7 Are not five sparrows sold for two farthings, and not one of them is forgotten before God? But even the very hairs of your head are all numbered. Fear not therefore: ye are of more value than many sparrows. 8. Isaiah 31:5 Like birds hovering overhead, the LORD Almighty will shield Jerusalem; he will shield it and deliver it, he will ‘pass over’ it and will rescue it. 9. Isaiah 40:29-31 He gives power to the weak and strength to the powerless. Even youths will become weak and tired, and young men will fall in exhaustion. But those who trust in the Lord will find new strength. They will soar high on wings like eagles. They will run and not grow weary. They will walk and not faint. 10. Psalm 147:7-9 Sing to the LORD with grateful praise; make music to our God on the harp. He covers the sky with clouds; he supplies the earth with rain and makes grass grow on the hills. He provides food for the cattle and for the young ravens when they call. 11. Job 38:41 Who provides food for the ravens when their young cry out to God and wander about in hunger? 12. Leviticus 11:13-20 And these you shall detest among the birds; they shall not be eaten; they are detestable: the eagle, the bearded vulture, the black vulture, the kite, the falcon of any kind, every raven of any kind, the ostrich, the nighthawk, the sea gull, the hawk of any kind, the little owl, the cormorant, the short-eared owl, the barn owl, the tawny owl, the carrion vulture, the stork, the heron of any kind, the hoopoe, and the bat. “All winged insects that go on all fours are detestable to you. 13. Psalm 136:25-26 He gives food to every living thing. His faithful love endures forever. Give thanks to the God of heaven. His faithful love endures forever. 14. Proverbs 27:8 Like a bird that flees its nest is anyone who flees from home. 15. Matthew 24:27-28 For as the lightning comes from the east and shines as far as the west, so will be the coming of the Son of Man. Wherever the corpse is, there the vultures will gather. 16. 1 Corinthians 15:39 Similarly there are different kinds of flesh–one kind for humans, another for animals, another for birds, and another for fish. 18. Isaiah 18:6 They shall be left together unto the fowls of the mountains, and to the beasts of the earth: and the fowls shall summer upon them, and all the beasts of the earth shall winter upon them. 19. Jeremiah 5:27 Like a cage filled with birds, their homes are filled with evil plots. And now they are great and rich. 20. Exodus 19:3-5 Then Moses climbed the mountain to appear before God. The Lord called to him from the mountain and said, Give these instructions to the family of Jacob; announce it to the descendants of Israel: You have seen what I did to the Egyptians. You know how I carried you on eagles’ wings and brought you to myself. Now if you will obey me and keep my covenant, you will be my own special treasure from among all the peoples on earth; for all the earth belongs to me. Next: Is It A Sin To Play Video Games?